When I lived in the Philippines, there was a string of about 7 months where I was eating at McDonald’s about 4 times a week. I was pretty consistent with my order: A cheeseburger combo meal with fries and drink. Here is where I learned about mixing my combo items. I would open up my cheeseburger and put fries in. It added a delicious crunch and added a bit more substance to the cheeseburger. I do this whenever I can now-a-days. 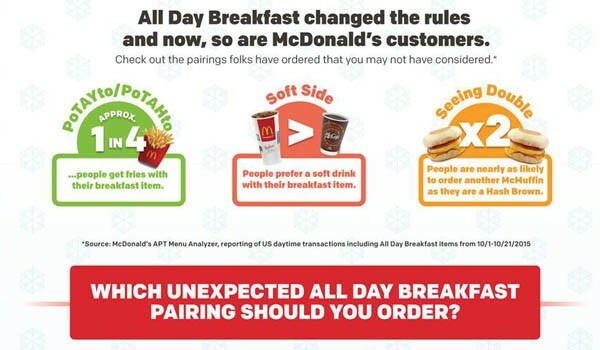 As you all know, McDonald’s has launched their all day breakfast, where you can get many of their regular, traditional breakfast items at any time of the day. This is great for me, as I really enjoy the McMuffin, but is always busy in the morning have to wait until lunch to get out and eat. McDonald’s was generous enough to let me try the new breakfast items (which I using during lunch time) in order to make a few pairing of my own. I haven’t had McDonald’s breakfast burrito before, but noticed it was a pretty good size for being only a dollar. I broke up a few pieces of fries and wrapped it into the burrito. This was a pretty great combination. 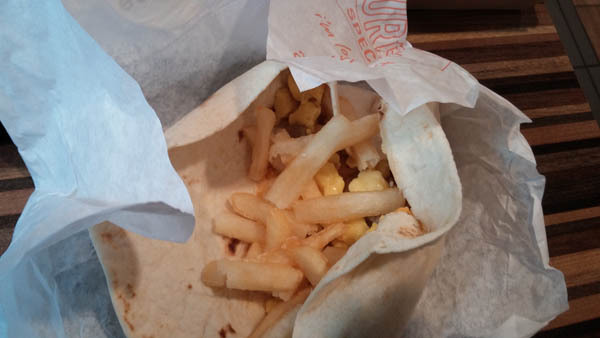 The fries were crispy, which counteracted the smoothness of egg and seemed to add some more substance to the burrito. This seemed to make a inexpensive dollar breakfast burrito into an elevated burrito that would typically cost a lot more. Definitely a great mashup to try. The cheese sauce also worked well with the fries. I have been a fan of nacho cheese and fries for a while, so the combo seemed to work well. Similar to what I usually do with adding fries to my burger, I wondered…what would happen if you added a hash brown to a Big Mac? I loved the concept of this, but in reality, it didn’t work quite as well as I had hoped. 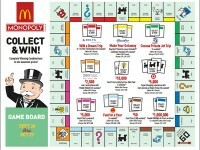 The Big Mac has so much going for it, that the hash brown gets a little lost under some of the other flavors. 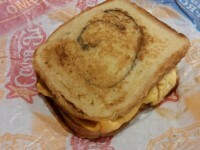 There is a definite added crunch that wasn’t there before, but the flavor of the hash brown didn’t quite get through. 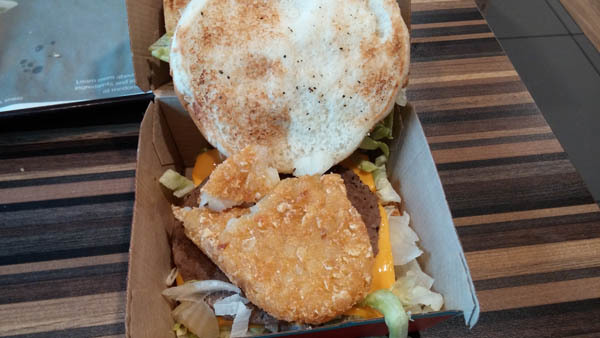 What I ended up trying is dipping the hash brown in some of the extra special sauce from the Big Mac, which was absolutely delicious. With the Big Mac probably being the most popular burger in the world, I’m assuming McDonald’s as the recipe pretty much figured out (so my attempt to make it better probably is futile). What are some other combinations you might want to try? Sausage McMuffin with Fries (we love eggs and hasbrowns..what about the softer fries?). 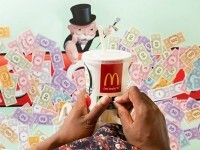 How about a Big Mac/Egg McMuffin? I love the taste of a fried egg on a burger…maybe replace the middle bun with the muffin? How about a carbonated orange juice? I’m not sure if that is possible or not, but with all the different combinations now available with breakfast being added to the menu all day, we can let our imaginations run wild.